There is a new arts publication in New England found in almost 700 museums, galleries and cafés. 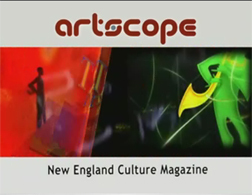 ARTSCOPE magazine, billed as "New England's Culture Magazine," is a full-color, bimonthly glossy, with listings and reviews of current exhibitions--you can actually read the exhibition reviews in the issue and go to the show at the same time--that is helping artists and art institutions to target and connect with art audiences throughout the region. "I am very happy to present the New England art community with the premier issue of Boston's newest publication, artscope," declared publisher Kaveh Mojtabai in ARTSCOPE's March/April 2006 premier issue. "This publication strives to fill a void in the general art community. We will bring you local, regional, and international gallery shows, theater and film reviews, and coverage from the music world and art happenings." So far, the magazine has been living up to its mission. Museums, galleries, and artists are sending in warm, welcoming letters and emails. ARTSCOPE is receptive to filling the void and the need to develop a network in the region. Some examples include the Worcester Artist Group advertising to reach out to a larger target audience in Boston and the Berkshires. A Wellfleet artist reviewed in the ARTSCOPE May/June 2006 issue developed a stronger Cape network when other artists read the review and invited him to hold a very successful joint opening reception. "With our third issue, we're expanding our coverage area to include Brattleboro's lively arts community, the Portsmouth, New Hampshire and Portland, Maine area, and previewing a musical opening at Hartford Stage later this month," says Features Editor Brian Goslow, who's a huge fan of the Brattleboro area, having been married at the Spiral Shop Gallery in Marlboro in 1999. "While the strong reputation of Boston's museums and galleries is well-deserved and rightfully earned, there're many world-class artists and cultural organizations throughout New England that remain 'undiscovered,' and we're thrilled to have the opportunity to bring them to the attention of a wider audience." EDITOR'S NOTE: Gallery Walk and Brattleboro's art scene will be profiled in an upcoming article by Greg Morell in the July/August issue of ARTSCOPE. We hope this is the beginning of a long and happy relationship between our publications as well as between ARTSCOPE and the many and varied arts organizations thriving in our neck of the woods.